Day 1: Get to Mu Cang Chai by bus (from the previous night) and arrive in late afternoon. You can choose to stay overnight in Tu Le (Tú Lệ) or Mu Cang Chai town for a taste of a mountain town. Day 2: Spend all day to wander on the beautiful terraces, you should rent a motorbike to travel (ask from your hotel or contact: +8429.6263.064 or +84166.568.4574). The region with the most stunning terraces is La Pan Tan village (bản La Pán Tẩn), located on the route from Tu Le to Mu Cang Chai. To get there, you can rent a motorbike, or take a motortaxi (xe ôm) or bus from Tu Le or Mu Cang Chai to La Pan Tan town. And from there is a nice trek up the mountain. Day 3: Catch a bus back to Hanoi. Motorbike is the best choice to for a Mu Cang Chai trip, on which you can easily travel to and stop at anywhere that you feel like to, which will be constant for sure. Some highlights in this itinerary: La Pan Tan terraces, Lim Mong valley (thung lũng Lìm Mông), Khau Pha mountain pass (đèo Khau Phạ – the longest mountain pass in Northern Vietnam). Especially, you should deeply go into La Pan Tan area. On the route, there’s a small trail along the valley, take that one and keep going. It will lead you to picturesque views (I found this place thanks to the help of a H’mong guy). Day 1: Ride to Nghia Lo (Nghĩa Lộ – a town located on the route from Hanoi-Mu Cang Chai) 190km or 120 miles from Hanoi. You should set out soon because night travelling by motorbike is not safe. Day 2: Explore the beauty of Khau Pha mountain pass, Lim Mong valley, La Pan Tan then stay overnight in Mu Cang Chai town. Day 3: Visit the remaining attractions and back to Hanoi. Day 1: Go straight to Mu Cang Chai. For th rest of the day, explore Lim Mong valley and Khau Pha pass. Overnight in Mu Cang Chai. Day 2: Explore La Pan Tan village and stay overnight in Nghia Lo town. Don’t forget to try specialty snake near Mien Tay hotel. Day 3: Visit Suoi Giang (Suối Giàng) then back to Hanoi in the afternoon. Remember to book early during high season. 2. Moon motel, tel: +84293.878.929 or +8491.205.88.99 or +84165.6782.888. The motel has wifi connection, breakfast and motorbike rent service. 4. Buu Dien guesthouse (Post Office guesthouse), contact Mr.Thanh +84975.644.965 to book, or ask him for contact if you prefer homestay. Hotel prices in Nghia Lo range from $8 to $10/double room. 9. Chuyen Dung hotel + restaurant is quite famous, $11 – $13 / double room. Foods in the hotel are usually sold out very soon, you have to order in advance. The restaurant is famous for sticky rice and chicken. You can have a longer trip, from 4 to 6 days, and combine 2 equally impressive places: Sapa + Mu Cang Chai. In Northern Vietnam, there’re 3 places that will ensure you a panoramic view of beautiful rice terraces: Sapa, Mu Cang Chai and Hoang Su Phi (Ha Giang). My question is, do you think from sapa, i could catch the train back to hanoi and stopping at Yen Bai to catch a bus/coach from there to Mu Cang Chai? And then back to Hanoi. Is it plausible? If so, where could i find the timetable and fares? Hi Mary! Your journey is so interesting! 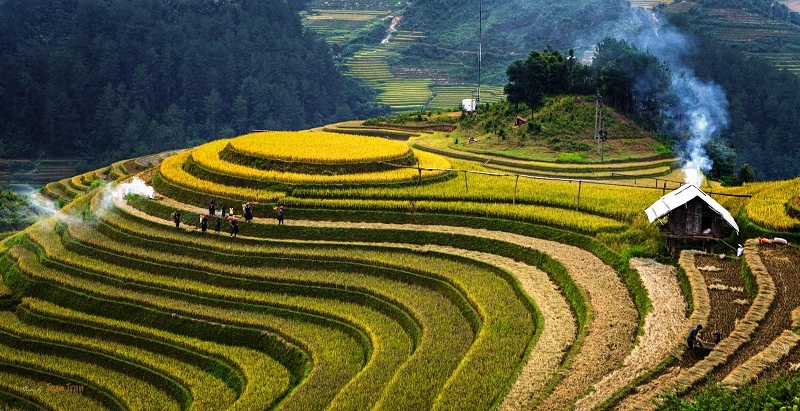 You’re going to visit 2 places where have the most beautiful rice terraces in Vietnam. For your question: yes you can! I think you can catch a bus from Yen Bai train station to get Mu Cang Chai. The fare is about $5 / one and There are many bus trips / day. Hope my answer is helpful for you! Thank you for this great blog post, it is great information. Do you know if April is a good month to visit Mu Cang Chai? Hi Roy, sorry for late reply! For your question – April is not good because this is rainy season. You should visit in May or Jun. This perriod, people will be preparing cultivation. How come even agencies don’t know how to get there…I asked so many of them or looks like they advise not to as it’s apparently not safe :/ You think it’s all right yeah Dat Hoang. Sorry for this stupid question but im quite intrigued about what travel agencies are telling me! Thanks for your help. Well Marry! Your journey is very interesting but also quite hard and not safe if you (a woman) travel Sapa and Mu Cang Chai alone and do not know our language. You should find a partner or simply buy a tour from travel agencies. There are many travel agencies having Sapa – Mu Cang Chai tour. Hi, thank you for your infos. May I ask you one question, how to go Sapa from Mu Cang Chai ? By bus? I cannot ride a motobike, how can I go around Mu Cang Chai? Can you advise which hotel can speak english due to I called Suio Mo hotel but they can’t speak english. The roads to go to villages are not good for big vehicles (like car), so if you can not go by motobike, I think you have to walk or rent a local to carry you. I don’t know any hotel that can speak English, I visited Mu Cang Chai twice and in both, I stayed at houses of locals. Sorry! Thanks for the great post! Was debating between going to Sapa or Mu Cang Chai this weekend and was wondering what the rice terraces at Mu Cang Chai look like right now? Thanks! Love your blog! I found very useful information here. Do you think the 3rd week of july is a good time to go to Mu Can Chai? Yes, it’s good time, sunny and cool rice terraces, but not the best time. The best is November. I am confused because here it says best time is November and the other says September to October. I visited Mu Cang Chai few times so I know the best period is the September 15 to October 20. The grain season might change between years but not too much, just few days. Early October is best for me so good to know I can still see the terraces. Oh I’m so sorry about it! It’s a mistake! Nov is good, not best. Sorry! Bonjour, Mon nom est Carmen. Je suis du Canada. Je serai au Vietnam du 18 juin au 1 Juillet. Je suis photographe Amateur. Avant tout me rendre à Mu Cang Chai et Sapa. Et loger dans la Maison de l’habitant. Il serait agréable de m’y rendre avec un (e) partenaire de voyage. Voyage avant tout axé sur la photo. Soyez bien à l’aise de communiquer avec moi. J’aime aussi voyager en moto. I’m so sorry but I can’t understand your language. Please write it in English. Thank you! Please, do you know about any bus which is going from Mu Cang Chai to Hanoi in the morning or afternoon? Hello Barbara. There are many buses from Mu Cang Chai to Hanoi. Just go to highway and catch one. La Pan Tan is a small and poor village so it’s hard to hire a taxi and also no bus, but can hire a vehicle that we call “hugged moto” (xe ôm). It’s cheap and very convenient! I referred to the response to Babara in the conversation thread on July 14. I am also not very keen on riding a motorbike. Are there bicycle rental shops in Mu Cang Chai town for me to rent a bicycle and explore the area myself instead? If so, is it possible to ride a bicycle to La Pan Tan from Mu Cang Chai town, from your knowledge of distance and terrain. Will like to hear your input on it. I didn’t see any bicycle rental shop in Mu Cang Chai. I just also asked my friends and they also said there’s no one. Sorry! Is December a good time to visit? will the terraces be green or not at all? Hello! Thank you so much for this great Information about Mu Cang Chai! We’re thinking about renting a motorbike, do you think a normal Scooter Is enough or should we Rent a Motocross? I’m so sorry for my late reply. I was very busy with my work. For you question, Just normal scooter is enough, I rided it in Mu Cang Chai. Hope this answer is still helpful to you! hello. I want very much to visit this beautiful town, but we go to Vietnam in the end of february 2016. Do you reccomend to visit Mu Cang Chai on February 27th? I understand that the best time to visit is july or september but we have not such an option, so we now have to decide to go to that side or not at all. The most I am afraid off that there will be no rice at all, plain brown terraces and nothing about super mountain view.. couls someone help me? thank you. I would like to photograph the Mu Cang Chai flooded rice fields. Towards the end of May is a good time? It’s very hot? It’s raining? P.s Sorry for my english, I’m italian. The best time to visit Mu Cang Chai is end of September to mid of October. End of May is in summer, there are heavy rains so I thinks it’s not good. There are so many hotels in Sapa, you can book one easily at here. And the Mu Cang Chai, there are few small hotels in the town but you can’t find it on internet, you have to book directly when get the town. Did you mean homestays? You can find homestays in villages. They will have a board that say “homestay”, “guest house”. Or even you can can ask locals (in villages) for staying overnight. I’m so sorry for my late reply! The time you ask is Tet Holiday – the biggest hoilday of Vietnam so I could not reply, sorry! If you want to talk with me for more question and get replied sooner, you can add my Skype – Atomhoang. Thank you! First all, congratulations for your good blog! Very useful information. We (2 people) are thinking on visiting Mu Cang Chai area next september (from 2nd September). I have some questions and maybe you can help me. We will arrive Hanoi on evening 1st September, and 2nd is National Independence holiday, so, do you think we will be able to buy the ticket bus for next morning Saturday 3rd? I suppose maybe the ticket counters will be closed… Where I can buy the tickets? Is possible from internet in advance? Returning to Mu Cang Chai issue, I know there is 2 ways: 1) Direct bus to Mu Cang Chai (i think it’s bus Hanoi-Lai Chau) or 2) Bus to Yen Bai (bus Hano-Lao Cai) and then transport (van?bus? motorbike?) to Mu Cang Chai. What do you think is better, according to the state of roads, the duration of travel ? Do you know the timetable for busest Hanoi to Yen Bai, Hanoi to Mu Cang Chai, and reverse? I think there is a night bus Hanoi to Mu Cang Chai, starting in the evening, do you know what time arrive? I reply your questions at the article of Hoi An, http://www.vietnamtriptips.com/hoi-an-vietnam-travel-guide-tips-experiences/. About the bus, I visit Mu Cang Chai by motorbike at all time, so I don’t know about timetable for sure but I know there are buses from Ha Noi to Mu Cang Chai, or buses go from Ha Noi to Lai Chau will also cross Mu Cang Chai. Then you should rent a motorbike to visit the town and rice fields. Very informative of your blog. I be heading to Vietnam in first week of May. May I know what would the view of Mu Cang Chai be for that time? Is it still covered with lush green or will it be all brown ready for the next planting season? I think if you visit Mu Cang Chai in May, you will see brown fields with water ready for planting in Jun. Very sorry, you can’t see green terrace in April. The planting season will start on May, if you want to see green terraces, I think July is the best time. I just want to check with you is end of April 2016 a good time to visit mu cang chai?? Thank you for all the great information you have shared on your blog! I only advise you to take out the information about the buses from Hanoi to Mu Cang Chai, because one of my Vietnamese friends called all those bus companies and none of them ride to this place. And I tried to buy my bus ticket in advance and as you mentioned, I could not buy it. They told me to be at the bus station at 4pm and apparently the bus leaves at 5pm. I hope it works that way. Sorry for my late reply. I was so busy with job. I will check the information you provided. It’s a long time and these buses may be no longer work on this route. I’m so sorry and thank you for your feedback! which one is better sapa or mu chang chai or nghia lo? I think Sapa is better, it’s easier to reach with a foreigner, especially you travel with old parent. But if you’re looking for a quite and wild place, you should visit Mu Cang Chai. And Nghia Lo, nothing to visit in Nghia Lo, it’s just small town close to Mu Cang Chai.